Hosting Center Ukraine Review 2019: Is Hosting Center Ukraine a Good Hosting? Hosting Center Ukraine provides a very simple set of three hosting plans, but I suggest you proceed with caution until you can contact the company. Hosting Center Ukraine has been offering hosting and domain registration services to its clients in Ukraine and the CIS countries since 2005. Its equipment is located in two data centers, in Moscow and Kiev. This vendor’s website can be viewed in the Russian and Ukrainian languages. Hosting Center Ukraine doesn’t believe in presenting its customers with complicated choices. Having served scores of customers over many years, this company thinks it knows what customers want: quality service and simple site management. Consequently, it offers just three (virtual) hosting plans: Tariff One, Tariff Two, and Tariff Three. 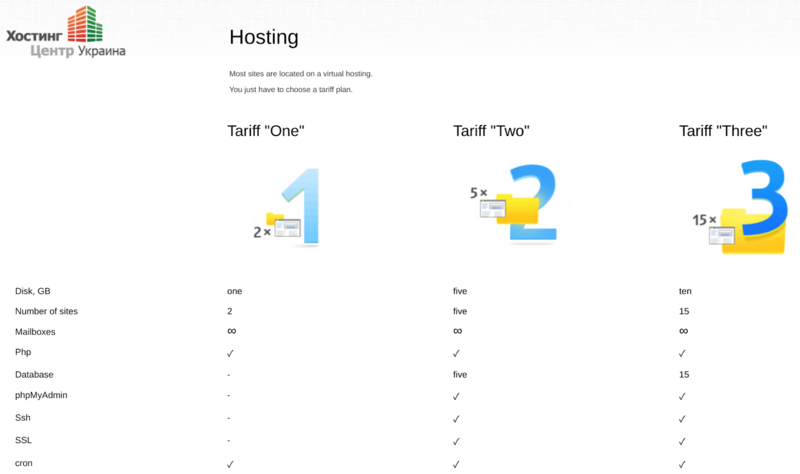 Tariff One gives you 1 GB disk space, two sites, unlimited mailboxes, PHP, and Cron. The other two hosting plans have more and better features, including 5 GB and 10 GB disk space, 5 and 15 sites, plus 5 and 15 databases respectively. These plans also provide phpMyAdmin, SSH, and SSL. The company’s Tier 3 data centers (in Moscow and Kiev) are equipped with enterprise-class hard drives, powerful Intel Xeon processors, fault-tolerant RAID controllers, and Supermicro servers. Although Hosting Center Ukraine makes bold claims, I struggled to place an order, and all my attempts resulted in a “This site can’t be reached” error. Another downer for me is that there is no uptime guarantee as far as I can see. Hosting Center Ukraine’s web hosting plans must be paid for annually in Ukrainian hryvnia via various methods. Since the company offers no free trial and no money-back guarantee, you might not be comfortable about making the one-year commitment despite the dirt cheap prices. You can supposedly reach this company’s support staff via phone, fax, or email. The support page on the website has a link to an online form, but I found its ‘send’ button to be non-functional. I also failed to summon any kind of support via email, and the link to this vendor’s “Personal Area” also doesn’t work. This all begs the question, “Is this company still in operation?” so I suggest you proceed with caution. If you are looking for web hosting services at affordable prices in the CIS countries and Ukraine, you could consider Hosting Center Ukraine… if you can actually contact the company. Wondering how Hosting Center Ukraine stacks up against other Web Hosting companies? Enter any other Web Hosting company and we will give you a side-by-side comparison.